Two of the most impressive elements of Steve James' "Hoop Dreams” are captured again in "Raising Bertie," the latest from Kartemquin Films (makers of James’ landmark documentary, as well as “The Interrupters,” “The Trials of Muhammad Ali,” and many more). When I saw “Hoop Dreams” for the first time, I can remember being instantly impressed with two structural elements of the film—the time commitment and the hands-off approach. James and his crew spent so much time with their subjects, allowing their growth and the impact of events in their lives to dictate the content of the film. And, along the same lines, they never felt like they were intervening, taking an approach often referred to as cinéma vérité. 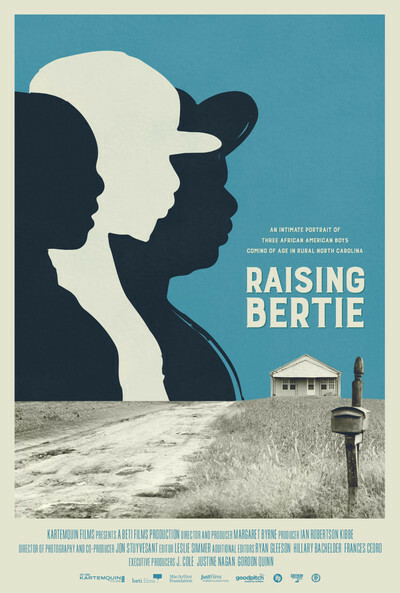 Both aspects of that approach are at the foundation of “Raising Bertie.” The filmmakers, led by Margaret Byrne in her debut directorial effort, spent years with their subjects, and they offer their stories to us without much commentary, just allowing us a window into lives that are likely very different from our own. Roger’s famous quote about film being an empathy machine has been making the rounds extensively since the election last week, and it seems apt here in that I never would have heard of Bertie, North Carolina if it weren’t for this movie, and using art to learn about every corner of our country seems more essential than ever. Byrne started the project with an effort to make a film about The Hive, an alternative school for at-risk boys in Bertie. There she met three young men, Reginald 'Junior' Askew, David 'Bud' Perry and Davonte 'Dada' Harrell. All three men were on the precipice of falling through society’s cracks, as made clear by community activist Vivian Saunders when she notes how close the Hive is to one of many nearby prisons. At a certain point, these young men have a choice to commit to education or risk ending up at one of those state-run institutions like so many of their fathers, friends and brothers. Saunders hopes that The Hive will be the life preserver these young men need. Then the Board of Education closes it. With that change in focus, Byrne’s film became something else. The three boys are forced to return to Bertie High School, even though they already struggled there in the past, and the sense that this couldn’t possibly work out for them is palpable. Watching them struggle to concentrate during class and feel even more isolated from the process is heartbreaking. Byrne’s approach shows a clear affection for these three young men, especially as they come of age before our eyes, becoming men instead of boys. It's also fascinating to consider how the production changed their trajectory. In one of the film’s most memorable moments, Junior has faced a life setback that he seems reticent to talk about on camera for fear of embarrassment. How much did the entire production of “Raising Bertie” change their lives just by being a potentially judgmental observer? There are times when “Raising Bertie” can seem a bit too unfocused, but it’s a project that always feels worthwhile for the opportunity it provides to expand an often-narrow view of the country. The conversation of the United States is often defined by what people think and feel on the coasts, and we were certainly reminded recently that there can be very different worldviews and experiences in the heartland that are rarely shown for public consumption. And yet it never feels like Byrne’s film is designed as a statement about all black young men living on the edge of poverty and falling through the cracks of our educational system. It is a case study, a film driven by the people it captures, and it fits the Kartemquin model of filmmaking well. They clearly believe that by getting to know others we also get to know ourselves.